SHOP.COM finds a place among the top marketplaces and has created a buzz among the online buyers in fond of extensive and effective online shopping. From clothes, beauty products, electronics, health and nutrition products, baby and kid's items to groceries and a lot more, accessing the wide array of voluminous products of different brands under one roof is a plausible option at SHOP.COM. Are you a retailer or a business owner in need of earning optimum level of exposure of your array of products and want to become a SHOP.COM seller? We, at ChannelSale, with our high-end software solutions and expert pool of marketers act as the SHOP.COM store manager for you. ChannelSale helps you to make your multi-channel marketing plan get the needed boost as we are here with our expert team of marketing pros and software solutions that will make the integration process with SHOP.COM a seamless process for you. With our SHOP.COM listing tools, we take A-Z care of SHOP.COM product listing management. So if you are swearing by the word exposure and want your products to hog the limelight in SHOP.COM, you have reasons enough to resort to us. The SHOP.COM listing process is a smooth one as we act the best facilitator with our SHOP.COM management tools. We give vent to your plans of tapping the potential target market and broaden the graph of your reach. With our real-time SHOP.COM inventory management services, you get a clear idea about your product performance and the apt reporting services that we engage in, help you to understand the transparency between under-selling products and over-selling ones. There is zero risk of error as we do the SHOP.COM product data feed management and optimization with the best software tools. We ensure that there is no flaw in the data transfer process as we aim for accuracy and use the best software solutions. We are confident of offering you proficient SHOP.COM order and shipping tracking management services. If you are thinking how we go about the product listing process on SHOP.COM , then this is the answer for you. We create the listing on SHOP.COM via your product feed file in formats like CSV, TXT, XLS or API-XML. Then we synchronize it with SHOP.COM along-with the big names among the online marketplaces, comparison shopping engines and affiliate networks. ChannelSale can integrate your product data feed to automatically flow in to Shop.com marketplace directly from your webstores such as Magento, BigCommerce, Volusion, Shopify, Yahoo store, AmeriCommerce, NetSuite, 3D Cart, Pinnacle cart amongst others. 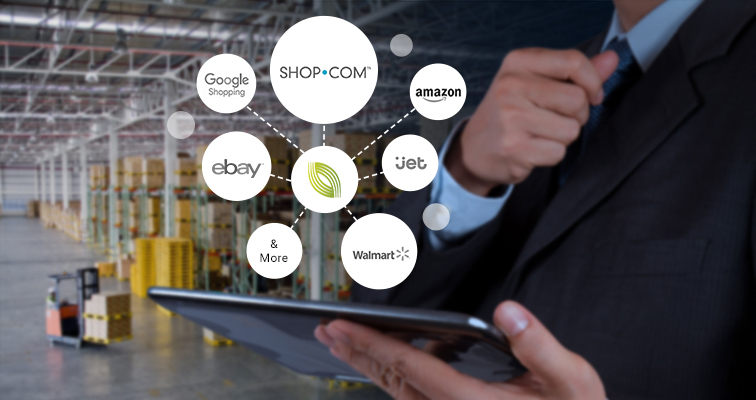 The Jet.com orders and shipping tracking updates can be synchronized with platforms such as Fulfilled by Amazon, SKU Vault, ShipWorks, ShipStation, StoneEdge, OrderMotion, OrderLogix, SOS Inventory and others. Granular level product category mappings pave the way for apt listing in sync with SHOP.COM product category. Have variable pricing for SHOP.COM and other marketplaces / shopping engines, or retrieve your SHOP.COM pricing to be sent to other shopping engines or markup pricing over cost price. ChannelSale offers real time inventory services, for you to track product performance. For example - If a product sells on Amazon, eBay, Sears, Rakuten, Wish etc., the updated stock in hand would reflect in your ChannelSale account and further on SHOP.COM . Centrally manage all SHOP.COM orders and shipping tracking updates. Automate exporting SHOP.COM orders to third party order fulfillment platforms / dropshipper’s, Fulfilled by Amazon, or to suppliers on an hourly basis. Setup to automatically retrieve order shipping tracking number on SHOP.COM . So in order to give your online business a new dimension, integrate with SHOP.COM and list your products to earn visibility and pad up your profit graph! Fulfil your dream to be known as one of the noted SHOP.COM sellers by sketching an effective multi-channel marketing plan with ChannelSale's assistance!